At Auto Detailing Austin, we are committed to informing consumers and providing assistance to help you keep your car looking its best. The most basic and common maintenance of a vehicle is washing the exterior. What most people do not realize is that in most cases swirls and scratches are created using poor washing techniques. Contrary to popular belief, most machine washes cause a large amount of scratches. Laser or touch-free car washes certainly help to prevent scratches; but even these machines may not really clean well enough, especially if your vehicle is very dirty. The truth is, the best way to wash is by hand; but even this method requires proper techniques and tools to reduce scratches and swirls. First, the selection of tools and chemicals is key. A power washer is a great investment that will save you time and provide a deeper clean. Just be careful, many power washers operate at a pressure or PSI that can damage areas on a vehicle. For economy and safety we recommend using an electric washer, such as the Sun Joe SPX3000. With any power washer, it is important to ensure you use a wide fan nozzle and still spray from a distance to reduce the risk of damaging loose paint. If you do not have the budget for this tool, you can still use a regular hose, just be sure to attach a nozzle that will allow for good pressure. Unfortunately, here in Texas, almost every city’s tap water has a large amount of deposits or dissolved solids. Here is an example of Austin City’s water test report. There a many problems with impure water. Often these impurities not only contain deposits that can cause hard water spots, but also chemicals left over from water treatment that can even alter the chemistry of cleaning chemicals. Generally most car washes are required to have a treatment system to make the wash water more pure or spot free. At the tap, this option is not as readily available. If you have a home water softener and can attach a hose, the water will certainly be more pure. What is recommended for at home car washing is a de-ionizing system. This system will help to remove impurities that can cause damage to your vehicle in the wash process. A portable unit is available by CR Spotless; but you can actually build your own for quite a bit less. Next on the list are your washing tools. We recommend operating with a 3 bucket system. However, with a power wash and foam cannon you can eliminate one of the buckets. It is very important that each bucket is used for one specific purpose and never used for something else. One bucket should be strictly dedicated washing wheels and wheel wells. You even will want to dedicate a scratch-free microfiber and wheel brush to only wheels and wells. Deposits from brake dust are harmful to paint and other surfaces. It is also strongly recommended to use proper protection gear, such as gloves and even eye protection so chemical splash back doesn’t go in your eyes when rinsing. The next two buckets are for the wash process. Both buckets will need a grit catch to help keep accumulated dirt from re-entering your washing materials and tools. We also recommend having several scratch free micro fiber cloths to serve separate purposes (explained later). You will need at least one scratch free microfiber wash mitt and we recommend two in case one gets dropped on the ground. Please remember, once a washing tool is dropped on the ground it needs to be very thoroughly cleaned or thrown away. The easiest way to scratch a vehicle is with contaminated washing tools. Last is scratch free, plush, drying towel. We do not recommend using a ‘shammy’ as these tend to lock in dirt and grit which can later scratch the vehicle when drying. If you have access to an air compressor and nozzle, it certainly helps to blast water out of cracks, door handles, mirrors, etc. There are a variety of brands and you may have to test things out to suit your preference. The main types of chemicals we recommend are as follows: a wheel cleaner (such as iron-x), a bug and tar remover and a wash soap (its useful to have one with a large amount of wax and one without, in case you want to wash and prep your paint for a wax or sealant). There are also chemicals designed to strip off waxes to prep the paint for a protection application. It is strongly recommend to always have wax or paint sealant on a vehicle as not only does it make washing off dirt easier, it helps to protect the paint from the environment. Optional items to consider are tire dressing, trim dressing and window cleaner. We do not recommend washing your car with dish soap. 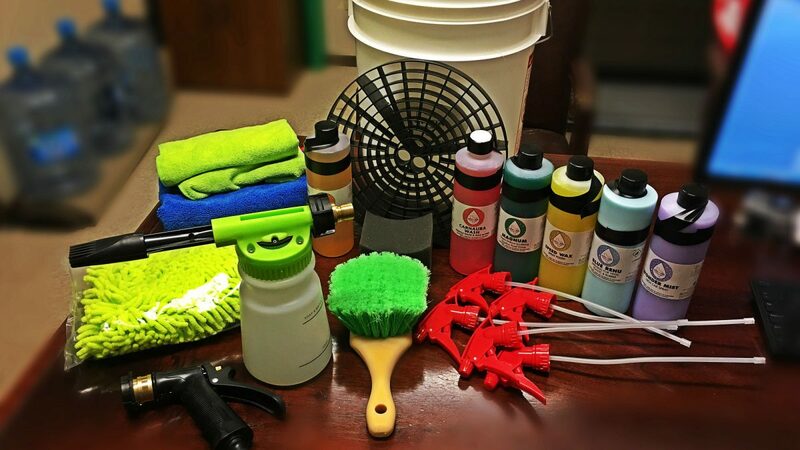 To make things simple, we sell an entire wash kit with all the tools and chemicals to get the job done. It is strongly recommended to wash your vehicle in a shaded area. You do not want to wash very hot panels or allow soaps or chemicals to dry on the paint. Always remember to be gentle when washing and move washing mitts and clothes in a straight line. Avoid washing in a circular motion, in case there is dirt or grit that can scratch, the scratch will be less visible if it is in a straight line. Step 2: Remove bugs from front of vehicle and mirrors. Utilize the same process as the wheels except use bug removal chemicals. We recommend a separate microfiber. You do not need to heavily scrub the paint. Let the chemicals dwell and do their job. With the proper chemical choice the bugs should be fairly easy to remove. Step 3: Clean side skirts (lower/underside trim) and lower half of bumpers. I usually prefer another separate microfiber for this. You can use a cleaning spray or soap and water to complete this process. This step is recommended because these portions of the vehicle usually have heavy dirt deposits. The cleaner you can keep your wash mitts, the less chance of scratching. At this point a good option is to clean the exhaust tips. You can use wheel cleaner and steel wool #0000 to scrub chrome wheel tips. You can also consider investing into chrome polish and a buffer. Step 4: Rinse as much loose dirty off vehicle as possible. I like using a power washer for this step as you can more easily clean debris from cracks and trim. I will usually rinse out inside gas tank cover at this point. Step 5: If no power washer is available, use the ‘two-bucket’ wash method. Fill the buckets a little less than halfway and use soapy water in one and clean ‘rinse’ water in the other. To do the two bucket method, you simply wash one panel at a time with your wash mitt and soapy water, then use the rinse bucket to clean out the wash mitt. Hose or rinse each panel afterwards. You can replace your bucket’s water if it starts to get very dirty. It is also important not to splash around the water. You want to dip the wash mitt and rub it against the grit catch to clean. The more still the water is the better the settled dirt will stay at the bottom of the bucket. If you are using a power washer, you can apply the soap section by section with a foam cannon. You would then only need one bucket to rinse the mitt after each panel. Step 6: A common mistake is to start scrubbing and drying the vehicle with a completely dry drying towel. A drying town should actually be moist. This will serve two purposes, the towel will better absorb water and the fibers will be softer with the moisture. You do not want to apply much pressure when drying. There are three ways to dry, one is with only air. The other is with a towel gently placing it in an area, patting it down and going to the next area. You can gently run the towel along the panels in a straight line, but avoid pushing, you only need to spread the water to dry evenly. If you are using a DI water system, air is the best. Also note that de-ionized water will greatly reduce hard water spots.